I cooked this afternoon, and it felt good. It was as if I found myself as I peeled and chopped. I am learning this new place in my parent’s home. No longer the child, I am now the caregiver. Lifelong roles have been ripped apart by my father’s death and my mother’s subsequent surgery. I was the wild child; now I am the golden child, stepping up to provide care and guidance and comfort. Today I am finding purpose in creating nourishment, finding patience with the simple repetitive steps involved in cutting apart chicken and chopping carrots. 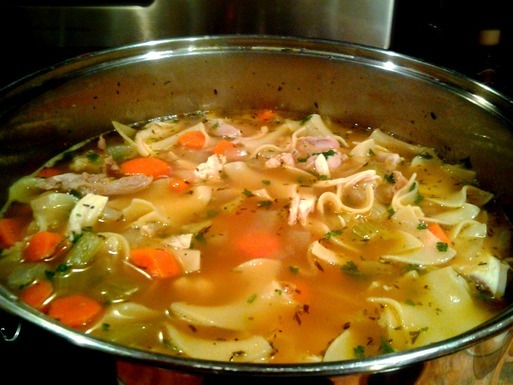 Could this be the secret behind the healing properties of chicken noodle soup? Is the salve to the soul of the cook as much of a succor to the sick as the carrots and onion in the broth? It felt right to simmer all day, despite the heat and the humidity. I feel like I am part of a long chain of women, all learning the same lesson as the generations fade into time. We find ourselves pouring ourselves into places we didn’t know about, oftentimes while standing in our kitchen. Looks yummy and there is a lot of love in that pot of soup. Thank you! Soup is definitely one of my fave things to cook – lots of chopping and not too much measuring is just my style 🙂 Thanks for checking out my post. I checked out your blog and LOVE your pix! Have a great day.